A veggie burger is a great meatless alternative for summer days, but they can sometimes be loaded with breading, fillers and oil and actually be less healthy than other burger options. This version is made with good-for-you ingredients and is held together with red quinoa – a tasty whole grain. 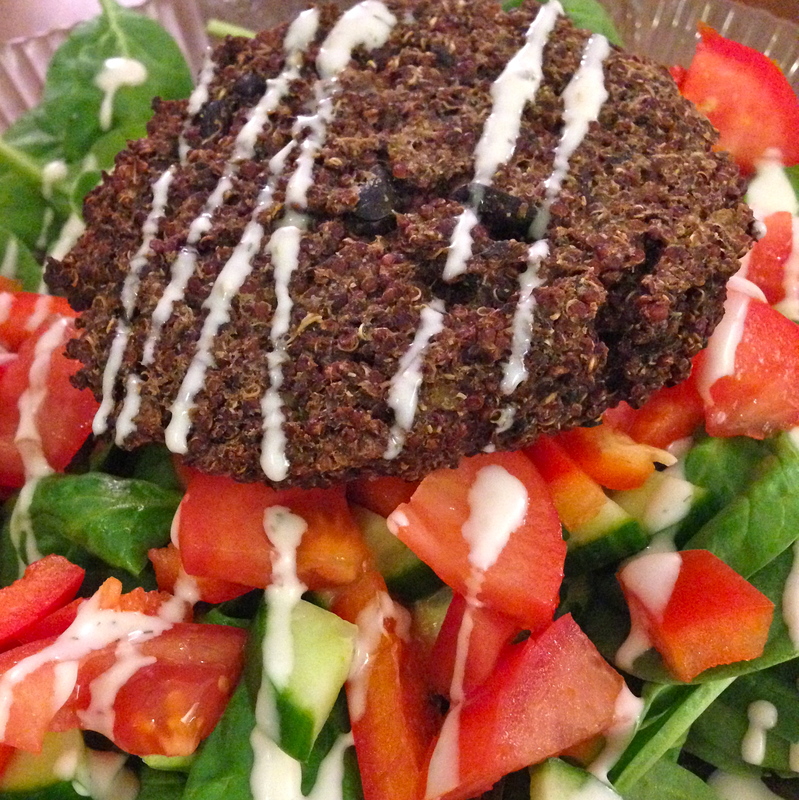 Fill up with protein, fiber and a handful of vitamins from this lightened-up veggie black bean quinoa burger! 2. Warm oil in medium pan (it helps to have one with sides, since it will get full) over medium heat. 3. Add onions to pan and cook 2-3 minutes. Add mushrooms and zucchini and cook another 5 minutes. 4. Add garlic, 1 C black beans and spices to pan. Cook another 5 minutes, stirring occasionally. 5. Preheat oven to 375 degrees Fahrenheit. 6. Place veggies in food processor. Add 1/2 C quinoa. Process mixture until pureed, about 15-30 seconds. Add mixture to large bowl and fold in remaining quinoa (for this recipe) and black beans. 7. Spray two 9 x 13 inch casserole dish with nonstick vegetable oil cooking spray. Take 1/4 C dry measuring cup and scoop mixture into hands, forming balls and pressing down to form patties. You should be able to fit about 4 patties in each dish. 8. 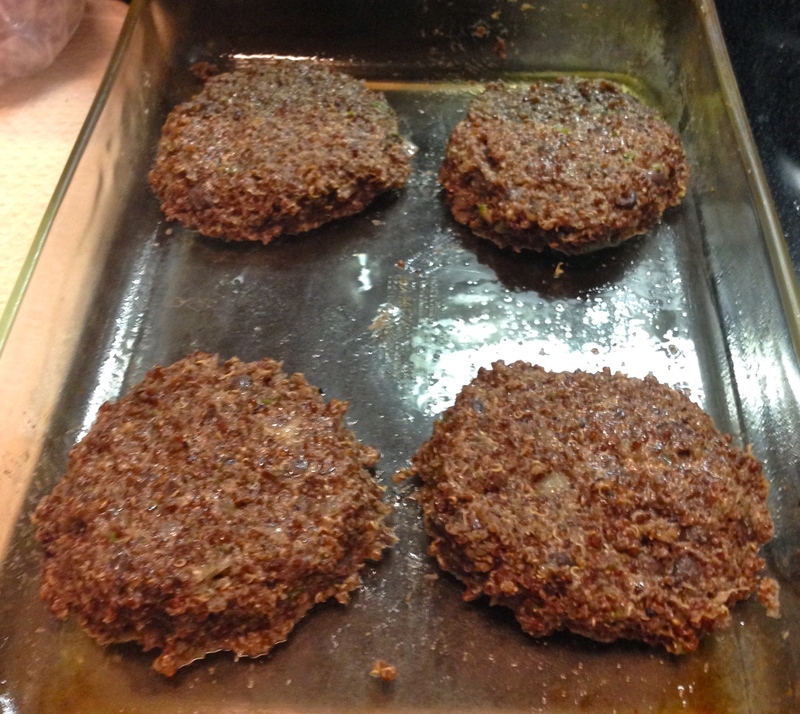 Bake patties 15-20 minutes on each side, until the outside is browned and crispy. Serve over bed of greens or a bun and enjoy! 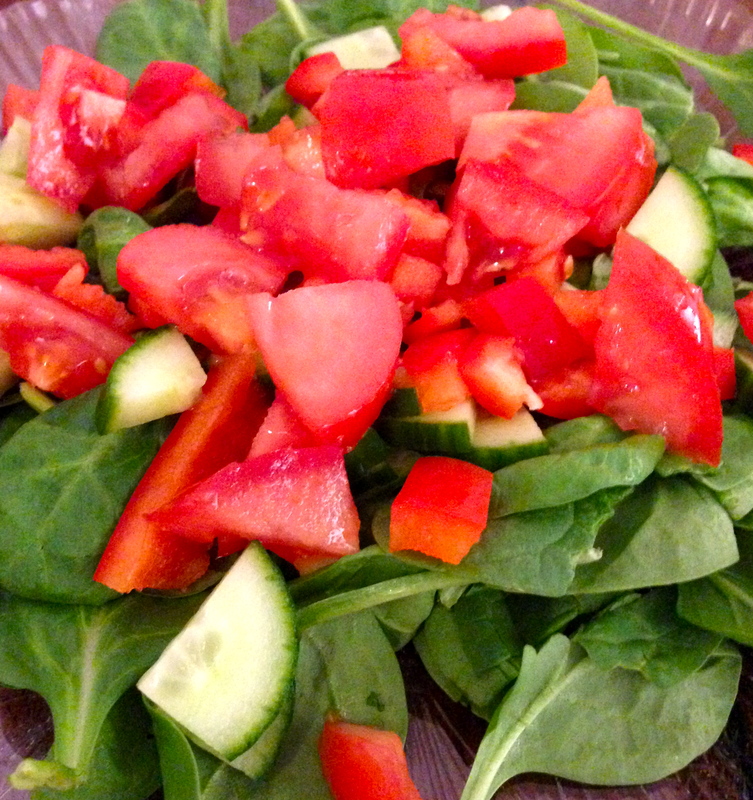 I put my burger on a bed of greens with tomato, cucumber and pepper – just top with patty and dressing! Clearly, I had some extra black beans, guacamole and salsa to use from yesterday’s unwrapped shrimp burrito. 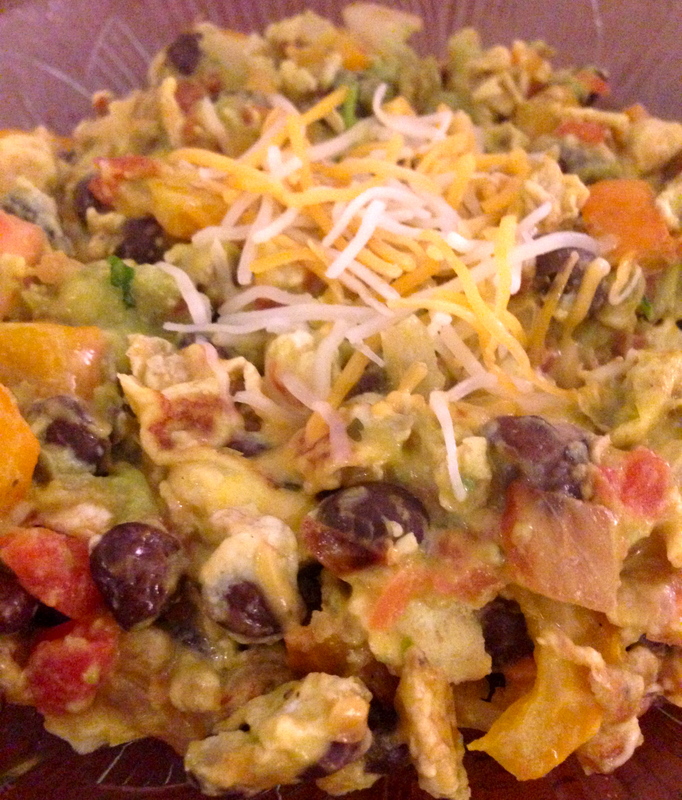 This morning, I made an amazing huevos rancheros scramble – and it only took about 15 minutes. This is going to be my new summer brunch special. With fiber from the black beans, monounsaturated fat from the avocado, beta-carotene from the tomatoes in the salsa and protein from the eggs, this breakfast is a nutritional powerhouse – and it’s delicious, too! 1. Heat butter in small skillet over medium heat. 2. Add onions to skillet. Cook 2-3 minutes, stirring occasionally. 3. Add peppers to onions in skillet. Cook another 5-7 minutes, stirring occassionally. 4. Add black beans to skillet. Cook another 1-2 minutes. 5.Crack eggs in medium bowl. Add splash of skim milk, salt and pepper. 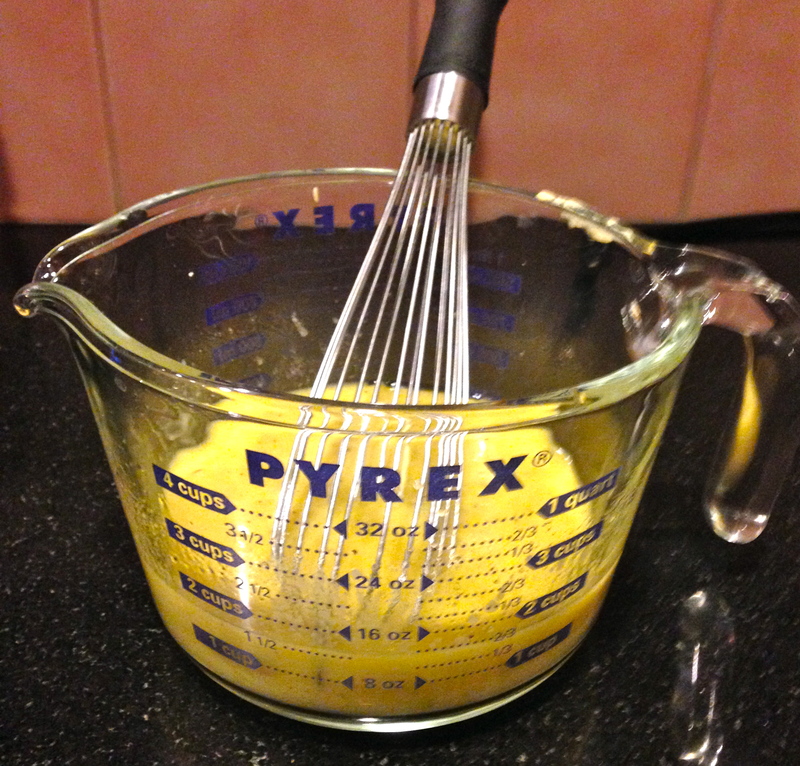 Whisk well and add to skillet.Cook eggs until dry and cooked through, about 5-8 minutes. Continue to stir and scramble occasionally. 6. Add guacamole, salsa and cheese. Cook another 1-2 minutes. Remove from heat and serve. *Note: Sodium content may vary greatly based on brands used for guacamole, salsa, cheese and beans. In this hot weather, I like to lighten things up. For this dish, I went tortilla-less and made a mixed plate filled with burrito-y goodness. 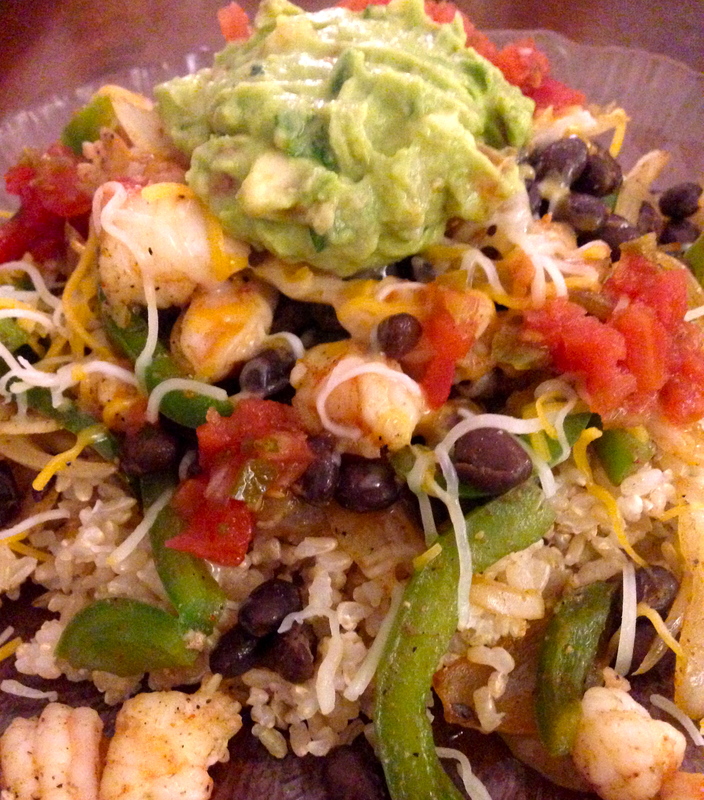 Spicy shrimp, onions, peppers and black beans offer a ton of flavor for minimal calories. Plus, the only grain on this plate is brown rice – a whole grain. This dish lets you spice things up while staying light and cool in the heat. 1. Warm 1 Tbsp oil in large skillet over medium heat. Warm remaining 1 tsp oil in separate, small skillet over medium heat. 2. 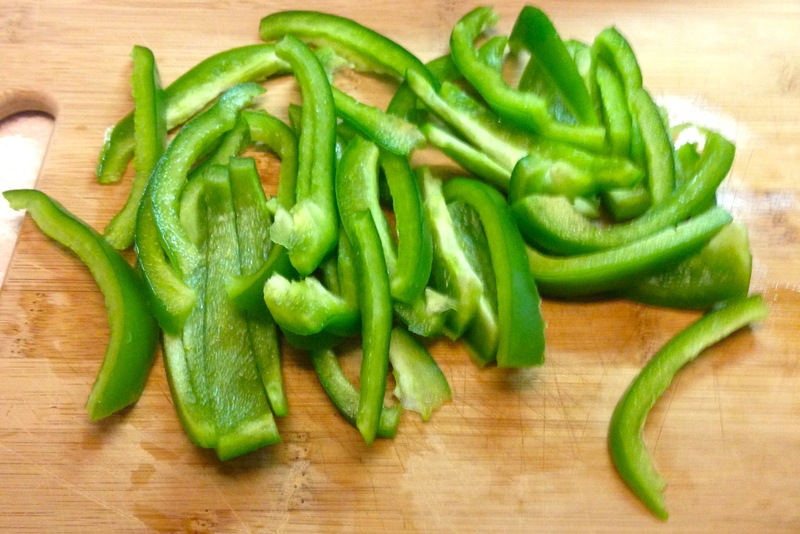 Wash bell pepper, remove stem and seeds and pat dry with paper towel. Cut into thin slices. Set aside. 3. Cut onion into thin, lengthwise strips. Add to large skillet. Cook 3-5 minutes, stirring occasionally. 4. On a separate cutting board, cut or pull the tails off of each shrimp. Remove the long vein that runs along the center of each shrimp. Cut each shrimp into thirds. 5. Add peppers and spices to large skillet with onions. Cook another 5-10 minutes, stirring occasionally. 6. Add shrimp to small skillet. If desired, add extra spices to shrimp skillet. Cook until shrimp are cooked through and no longer translucent, about 5-7 minutes. Stir occasionally. 8. 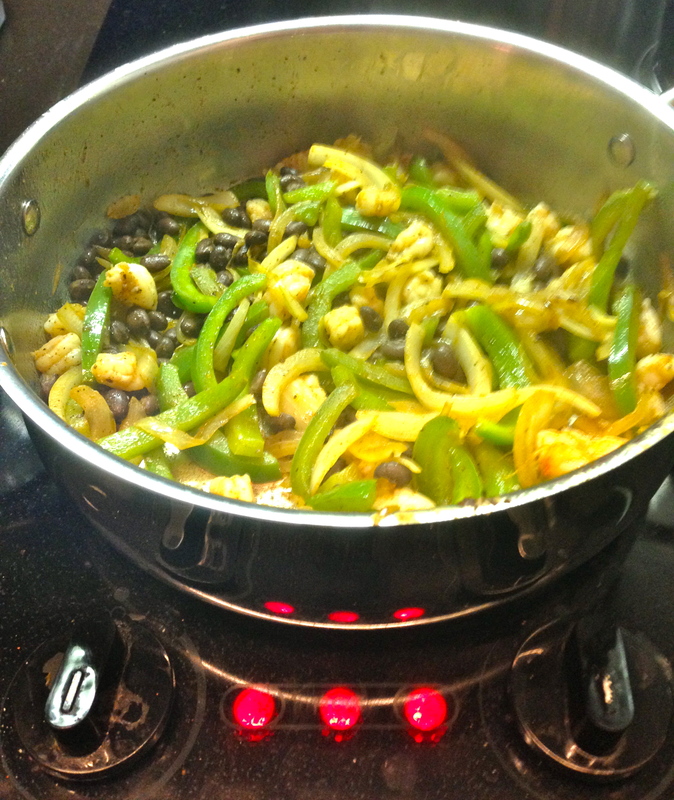 Add cooked shrimp and black beans to large skillet with vegetables. Combine. Add cheese, stir and remove from heat. 9. Place 1/2 C brown rice on each plate. Cover each plate of rice with half the shrimp and veggie mixture. Top each plate with 2 Tbsp guacamole and 2 Tbsp salsa. Enjoy! *Note: Sodium content will vary greatly depending on brands used for guacamole, cheese, salsa and beans. This estimation uses varieties with sodium in order to account for a possible range. There are a ton of rumors circulating about food and nutrition lately. It’s no wonder that all of these mixed messages – from reliable and unreliable sources – can cause confusion. I wanted to sort out a few food issues that I keep encountering over and over. After reading this, you will be able to sort fact from fiction and learn the truth about hot topics in food and nutrition. All oatmeal is not created equally. Many instant varieties contain a ton of ingredients that many of us can’t even pronounce. My rule of thumb is no one should need to be able to understand biochemistry in order to understand the ingredients listed on their food’s nutrition label (and if you do happen to have a degree in biochemistry, you would probably agree that many of those ingredients should not be consumed). 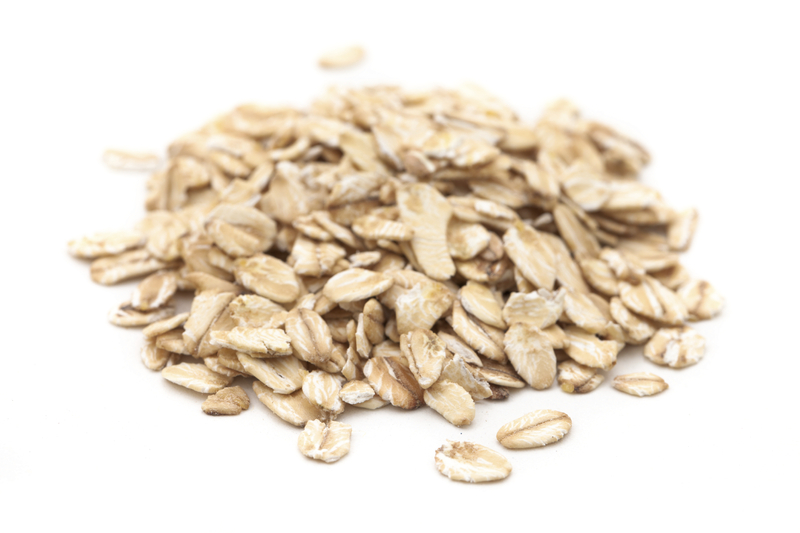 Your best bet is to buy rolled oats that list only rolled oats as the sole ingredient. Craving more of an instant fix from a packet? I like Trader Joe’s Oats and Flax oatmeal, which has just four ingredients (rolled oats, sugar, flaxseeds and sea salt). Also, beware of flavored varieties, which tend to contain a ton of excess sugar and additives. Stick with a plain oatmeal and add your own toppings, such as fruit, nuts, cinnamon, or even cocoa powder. I cringe when I hear this myth. In fact, egg yolks are the source of nutrients within eggs. While egg whites are a good option for those looking to decrease their calorie content, the whites offer little in the way of nutrition – just a small amount of protein and only about 20 calories per egg white, which is not very satiating. The egg yolk contains the lipids, vitamins and minerals that cause eggs to boast such great nutrition, and one large egg contains less than 80 calories. Also, egg yolks contain a substantial amount of choline, which is a nutrient that has been linked to enhancing memory. Start your day sharp and eat eggs (the entire egg!) and feel fuller, longer. Another great option? Combine one whole egg with two egg whites to shave off calories and fat while maintaining some of the nutrition of the whole egg. Also, that rumor about eggs being bad for cholesterol? False! Unless you already have high cholesterol, the cholesterol in eggs does not appear to raise one’s cholesterol. Now, no excuses! My Green Eggs, No Ham! 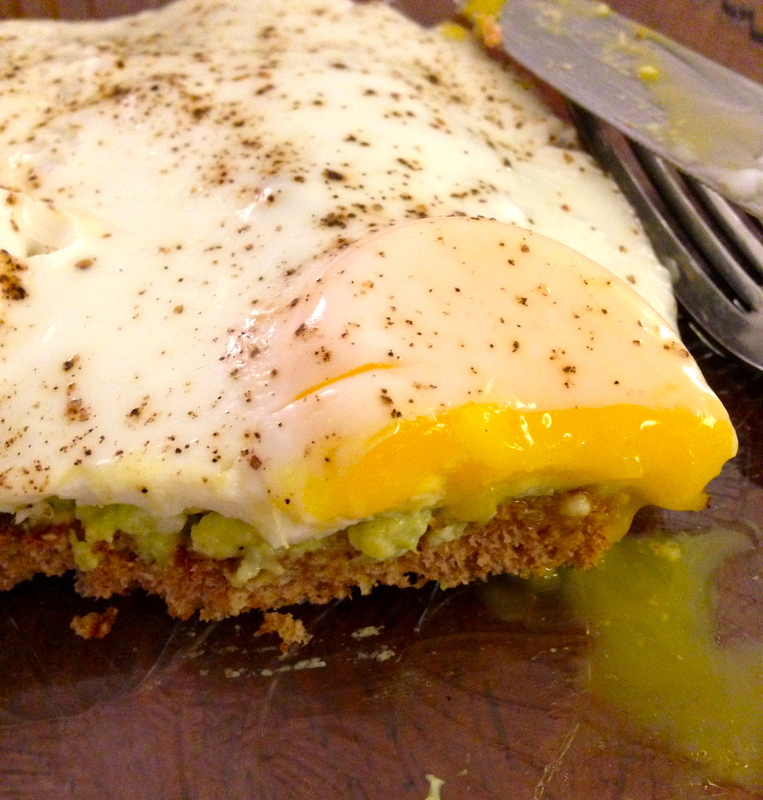 Avocado toast with sunny side up eggs – yum! Skipping breakfast is one of my biggest pet peeves. This myth is totally false. Want to hear a fact? Breakfast is actually the most important meal of the day. Overnight, we deplete our glycogen stores (our body’s storage form of glucose) and this stimulates a series of hormonal responses. Additionally, many individuals wake up with low blood glucose because of the lack of glycogen and exogenous fuel first thing in the morning. Eating breakfast (with some carbohydrates) helps to keep your hormones in check and replenishes your body with the fuel it needs to take on the day. Just like you would never drive a car without gasoline, you should never walk out your door in the morning without fueling up (properly). That being said, I even suggest that individuals eat a little bit of something (anything) rather than skip breakfast. People are often appalled by this, but I truly believe it is better to eat a half a bagel (or something else “shamed” by most) than skip breakfast entirely. Not hungry? That’s okay. Work your way to eating breakfast by beginning with something small (a few strawberries or a banana) and ultimately add in extras (add a piece of toast with peanut butter, or a small bowl of oatmeal). No time? I can solve that, too. Below are a few quick breakfast options. Again, no excuses! Make some hard boiled eggs at the beginning of the week and store in a bowl in your refrigerator. Grab and go! 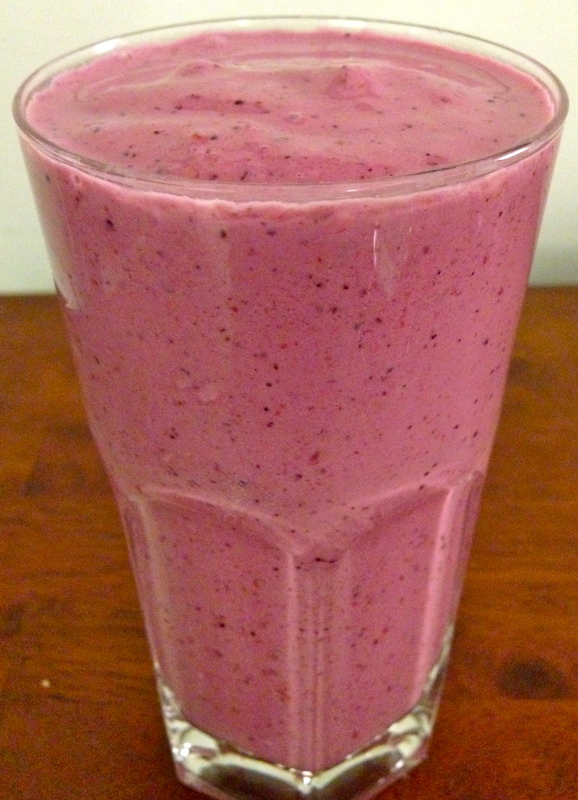 Make a breakfast smoothie the night before and store in your refrigerator, covered, until the next morning. Make a piece of toast and spread with a nut butter of choice. Add fruit (on the side or on top) to round out the meal. 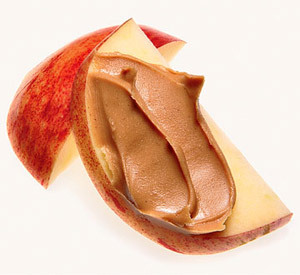 Bring an apple (or another fruit, like a banana) and some peanut butter with you out the door. It’s true that active individuals may require more protein than non-active individuals. However, most Americans already consume more protein than needed from diet alone. It is recommended that adults consume 0.8 g/kg body weight protein per day. For a 70 kg male (154 pounds), this equates to 56 grams of protein daily. That is not that much and can certainly be attained (and often is exceeded) by an adequate diet. While active individuals may require more protein, many guidelines recommend 1.0-1.7 g/kg body weight, depending on the activity (and the duration and frequency of the activity). So, at 1.5 g/kg body weight (which would be toward the upper range of protein recommendations), a 70 kg male would require 105 grams of protein per day. That post-workout protein shake? It’s probably just going to add excess calories and should only be consumed every once in awhile, if there aren’t other food options to provide the carbs and protein you need to refuel after a workout. Also, it should be noted that protein does not get stored like carbs and fat do within the body. So, what happens to protein that’s consumed beyond your body’s energy needs? It will either get excreted or stored as fat. 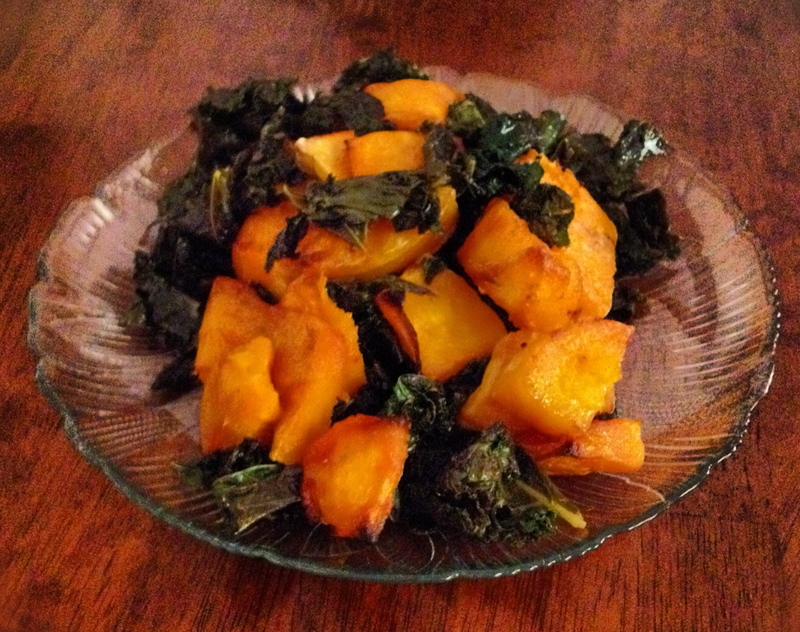 my warm kale and butternut squash salad! A good source of carbohydrates! I like carbohydrates. Repeat: I like carbohydrates. Carbs are your body’s main source of fuel – and they are everywhere (which is not a coincidence). It’s true that refined carbs are not ideal, as they offer little in the way of nutrients and are often enriched with vitamins and minerals that are taken out in processing, along with chemicals. However, eating whole grains, such as quinoa, whole wheat bread and pasta products and farro is recommended. Additionally, foods such as fruits (and many vegetables) offer carbohydrates – and there is no reason to run from them. Many of these foods also contain fiber, which many Americans lack in their diet. Also, your brain runs on glucose – about 50 grams of it per day. Without consuming glucose, your body converts fat to ketones, which your brain can use as a secondary fuel source – as a last resort. Relying on ketones regularly puts your body in an unhealthy state and prevents your brain from obtaining the fuel it needs and creating an optimal environment within your body for necessary enzymatic reactions. Many individuals require between 250-300 grams of carbohydrates per day, with active individuals often requiring even more than that. Put this into perspective next time you see that a snack contains 30 grams of carbs – it is probably okay to consume. I hope you enjoyed this post and learned that, while there are a ton of nutrition rumors out there, it is important to learn the facts and fuel your body right. Also, many fads do not hold up to the science and it is important to learn the science (or speak with someone who does understand and keep up with the science, such as a registered dietitian) to separate fact from fiction. Grill Up A Summer Steak Salad! Sorry I haven’t written in awhile. 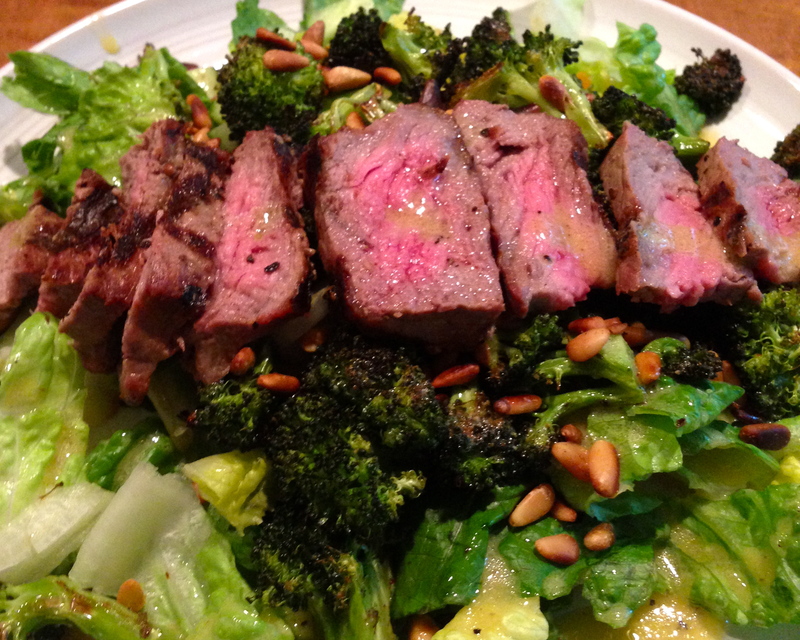 My computer was out of commission but now it’s working and I have a ton of amazing recipes and food and fitness tips to share with you – starting with this amazing summer steak salad. During the summer, I like to lighten things up – but that doesn’t mean I want to eat plain lettuce for dinner. This salad has all the taste of summer – grilled steak, fresh veggies, roasted broccoli, pine nuts and a citrus-y vinaigrette – for a satisfying way to eat your veggies and use your grill! Perfect for a warm summer night, this steak dish puts veggies center stage and offers up nutrients like vitamin B12, vitamin C, vitamin K, and beta-carotene. *Note: This salad is also an amazing use of leftover steak if you happen to have any from a previous barbeque! Roasted broccoli – good on its own or in a salad! 1. Preheat oven to 400 degrees Fahrenheit. Wash broccoli, pat dry and chop crowns into small pieces. Spread on baking sheet. Drizzle 1 Tbsp oil over broccoli and toss with a spoon to coat evenly. 2.Turn on grill to medium heat. Prepare steak with 2 Tbsp oil and salt and pepper. Transfer to grill. Cook steak as desired. *Note: All grills cook differently, but I typically cook steak for about 5-7 minutes on each side in order to achieve medium doneness. Let steak sit covered (i.e. : do not cut into it) for about 5 minutes once you remove the steak from the grill, as the steak will continue to cook due to residual heat. The steak should reach an internal temperature of at least 165 degrees Fahrenheit. 3. Place broccoli in oven. Roast for approximately 7-10 minutes, until broccoli is slightly browned. You may need to mix broccoli occasionally to prevent sticking. 4. 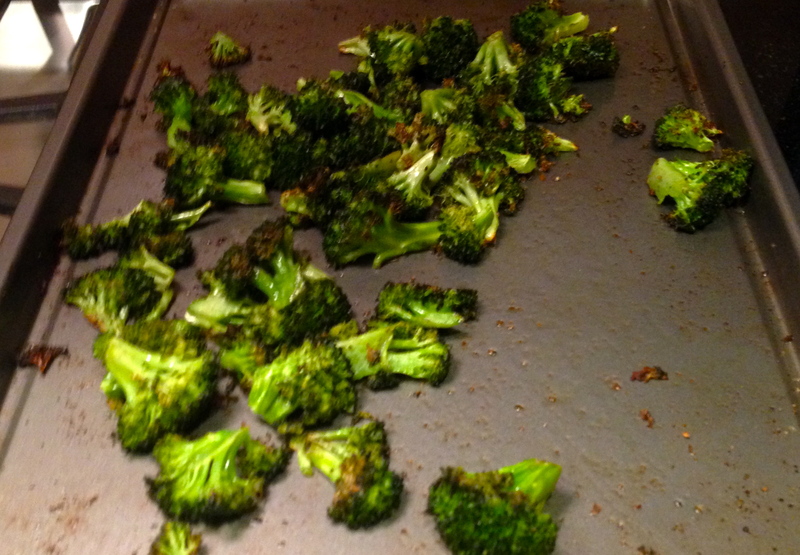 While broccoli is roasting, heat pine nuts (dry) in small skillet over medium heat, stirring occasionally. Cook until browned, approximately 5-10 minutes. 5. Quarter each cucumber slice. Divide lettuce, tomatoes and cucumber among two plates. 6. Slice steak in half. Divide each half into slices and place on top of lettuce. Add roasted broccoli and pine nuts. 7. Drizzle with a lemon vinaigrette of your choice (or make your own from the recipe below – super easy and healthy!). Enjoy! Now just pour into a container and store in the fridge! 1. Add each ingredient into a large bowl or salad dressing container. 2. Whisk or shake well until all ingredients are well-combined. 3. Chill in refrigerator until cold (approximately 30 minutes or more). Shake well before using and store in refrigerator. *One serving is half of the salad ingredients listed above with 2 Tbsp of the lemon dijon dressing. This will vary based on dressing used (if substituted) and different steak cuts.